Do not drive in Avalon. The wakes are causing problems for people near the streets. Please stay only on Commonwealth Blvd. 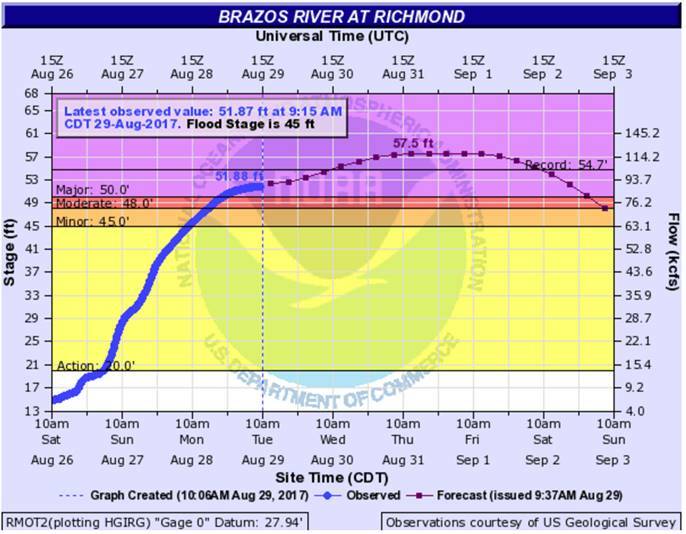 Overnight the Brazos River Watershed did not receive has much rainfall has anticipated. At 9:37 AM, the NWS reduced the forecasted peak to 57.5’ in Richmond on Thursday morning. The watershed is still predicted to get some additional rain today, but between our break from last night and a little less rain in the forecast, the watershed is getting some much needed relief. The District continued to pump overnight and will be pumping while the Brazos River is up to reduce the lake levels around the District.